Audi Certified, CARFAX 1-Owner, ONLY 8,394 Miles! Premium trim. PRICE DROP FROM $27,995, EPA 35 MPG Hwy/26 MPG City!, PRICED TO MOVE $1,700 below NADA Retail! Sunroof, Heated Leather Seats, Turbo, Back-Up Camera, HOMELINK - BLACK. CLICK ME! Leather Seats, Heated Driver Seat, Back-Up Camera. 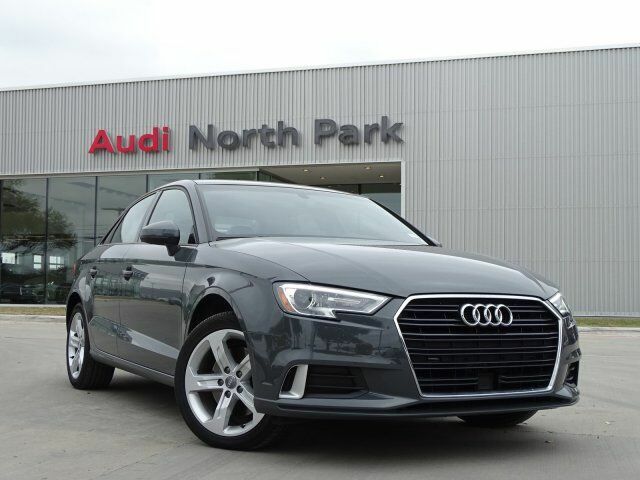 Audi Premium with Nano Gray Metallic exterior and Black interior features a 4 Cylinder Engine with 186 HP at 4400 RPM*. CONVENIENCE PACKAGE LED interior lighting package and Audi smartphone interface (Android Apple and Apple CarPlay), Audi Advanced Key, keyless start, stop and entry (sensor in front doors and trunk), HOMELINK - BLACK. MP3 Player, Sunroof, Aluminum Wheels, Child Safety Locks, Steering Wheel Controls, Heated Mirrors, Electronic Stability Control. Was $27,995. This A3 Sedan is priced $1,700 below NADA Retail.